Swarthmoor is a tranquil Cumbrian village located on the Furness peninsula near Ulverston and it has a social football club that was founded in 1946 and is still going strong. The village is best known for Swarthmoor Hall, a 16th century country house set in a 130 acre of estate. It is famous for being where the Quaker movement started in England and today visitors can take a guided tour around the house including 7 rooms that have particular links to the Quakers, as well as being able to take a pleasant stroll around the impressive gardens. Whether you prefer an energetic afternoon on the football pitch or some peace and quiet in Swarthmoor Hall’s fragrant grounds, the Hog Roast Swarthmoor team can provide you with food you will love with in any location and for any type of special occasion. We can offer you the best locally-produced pork in the area, which is always cooked to perfection thanks to our talented chefs and state of the art cooking equipment. Not only that, we also have a varied range of menus suitable for both formal and informal occasions, from feeding spectators tasty hog roast sandwiches with all the trimmings at a sporting event or outdoor festival, to providing elegant 3-course meals with full table service for wedding receptions. 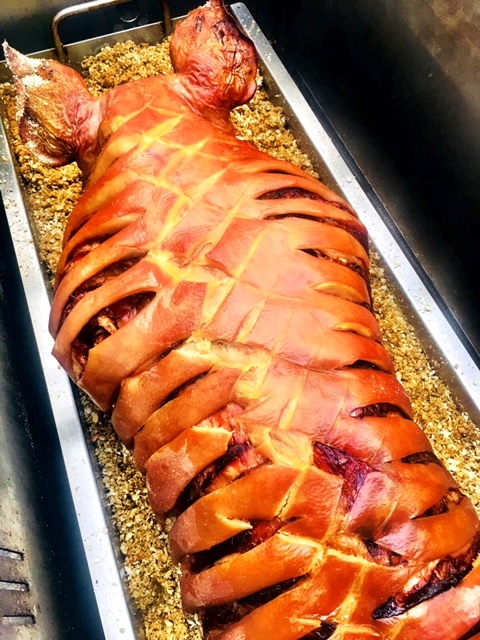 Even though we are first and foremost hog roast specialists, here at Hog Roast Swartmoor, we don’t limit ourselves to only offering one thing, however good it may be. We can provide a range of equally tasty alternative slow-roasted meats, including succulent sirloin of beef, organic whole roasted chicken and tender spring lamb. We also have an array of vegetarian options in our repertoire, as well as being able to cater for special dietary requirements by providing gluten-free substitutes for example. Even if you have chosen a full 3-course meal complete with welcome canapes for your special occasion, we always prepare everything from scratch at your venue on the day using only the best locally-sourced ingredients and we can serve it as a buffet or traditional sit-down meal depending on your requirements. If you are looking for a flexible catering company who will guarantee to give you fantastic freshly cooked food that will please everyone, Hog Roast Swarthmoor are the ideal option for your special day.